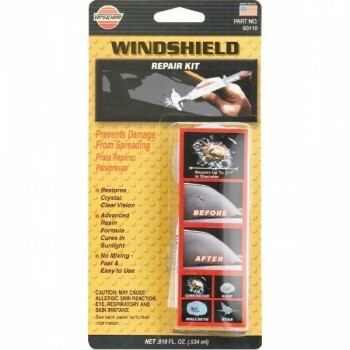 PRODUCT DESCRIPTION: Make permanent air-tight repairs on most types of damaged laminated windshield glass, including bullseye’s, star damage and chips up to 1 1/4 inches, in just a few minutes. This state-of-the-art delivery system with advanced spring-lock feature, allows you to make professional-quality repairs with no mixing required and it cures by natural daylight. This complete kit provides everything needed for the repair including easy-to-follow instructions with photographs. WORKS BEST ON: bullseye’s, star damage, small spider webs and chips up to 1 1/4 inches in laminated automotive windshields. NOTE: Ultra violet sun rays cure the resin, when repair is complete move vehicle into direct sunlight for 15 minutes. (On hazy days, park vehicle outside for a minimum of one hour). DO NOT Allow the resin in the syringe to come in contact with the automobile’s finish as this may cause damage. READ DIRECTIONS COMPLETELY ON THE PACKAGE INSERT PRIOR TO STARTING REPAIR. SURFACE PREPARATION: Clean out any loose glass particles from Pit (hole caused by striking object) of the break using push pin provided. 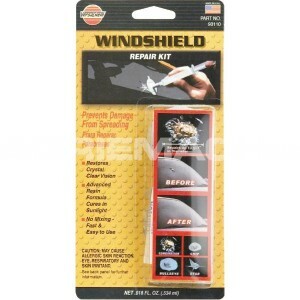 Using an alcohol wipe, clean area surrounding the break on both the outside and inside of the windshield. REMOVAL METHODS: Wipe up any excess resin with a clean cloth or paper towel. Cured resin must be scraped off windshield with a safety razor. Wash hands thoroughly with soap and water. HELPFUL HINTS: If the surface of the glass is uneven, the safety razor provided may be used to remove any excess cured resin from windshield. Clean windshield with glass cleaner or alcohol wipe. IMPORTANT: Once the resin is cured (step #11 in the instructions), carefully remove the clear yellow curing strip by peeling it away from the windshield. The curing film can also be removed with a safety razor.